A completely new, revised, and expanded edition of Dr. John C. Whitcomb’s creationist classic book “The Early Earth: An Introduction to Biblical Creationism” has just been released by BMH Books of Winona Lake, Indiana. The 176-page paperback, which retails for $18, is a companion to Whitcomb’s “The World That Perished” and this revised version includes dozens of updates and recent citations that strengthen Whitcomb’s stellar defense of biblical creationism. The book is organized into five sections, and includes more than dozen special illustrations and explanations that will be of interest to both mature and younger readers. They include interesting sidelights on such subjects as whales, the duck-billed platypus, dinosaurs, bacterial flagellum, and more. In addition to an 11-page bibliography reflecting the latest scientific information from books and journal articles, the revised version also includes extensive subject and author and scripture indices. The author, John C. Whitcomb, Th.D., taught Old Testament for 38 years at Grace Theological Seminary, Winona Lake, Indiana. He is the author of a significant number of books and articles on science and scripture. He, along with Dr. Henry Morris, co-authored the now-classic “The Genesis Flood” which first appeared 50 years ago. 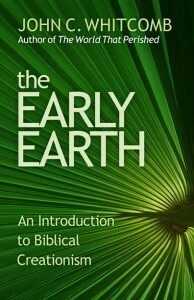 The ISBN for “The Early Earth” is 978-0-88469-268-3 and it is available wherever books are sold in stores or online or from BMH books at www.bmhbooks.com or by calling (toll-free) 1-800-348-2756.